This is our middle length holiday covering St Ives to Penzance. 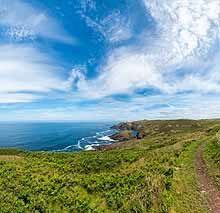 With the 4 day walking itinerary set out below, one of the hardest but shortest sections is on day one between St Ives and Zennor. This means that you get the slightly tougher section completed on day one to allow you to enjoy the route as it winds down across the coastline to Penzance. Luggage Transport We will transfer your luggage between each overnight stop, you leave your luggage at the accommodation when you set off in the morning and it will be moved on to your next B&B. You only need to carry a small day sack with the clothes and provisions you require during the day’s walk.